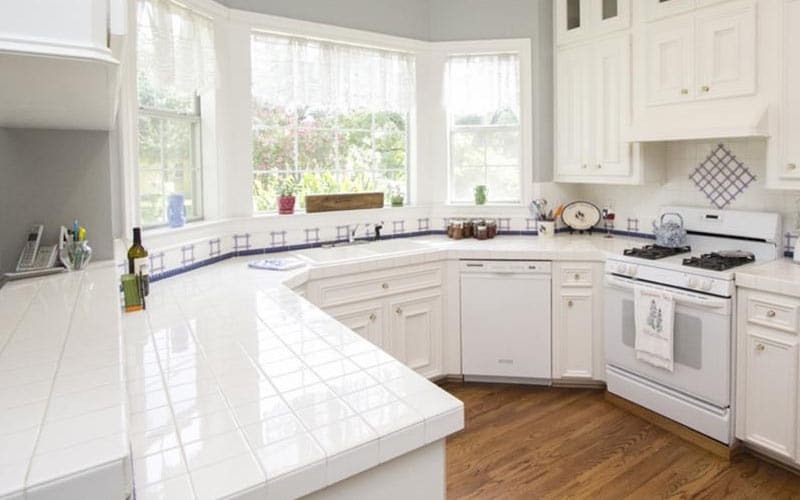 Countertops are one of the defining features of a kitchen. 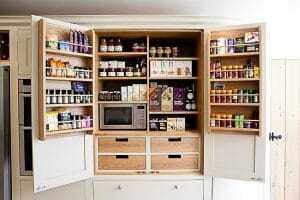 In addition to having visual impact, they are the work space where you chop, mix and clean day in and day out. That means they have to look good and work hard. Here’s how to find the right look that works for you. 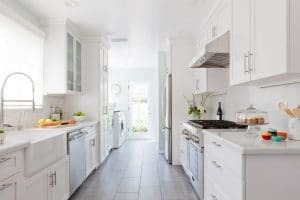 There are three things to consider when choosing a countertop. First, appearance. Do you want light or dark, matte or shiny, a pattern or solid? There are many many options to choose from at a range of price points. If you can’t decide, a combination of countertop materials creates multiple workspaces with different functions. The second is maintenance. 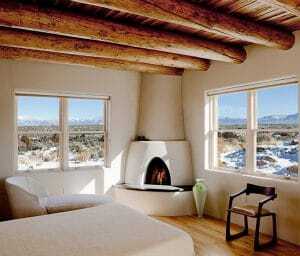 Natural stone is beautiful but in addition to being pricey, each stone has its cons. 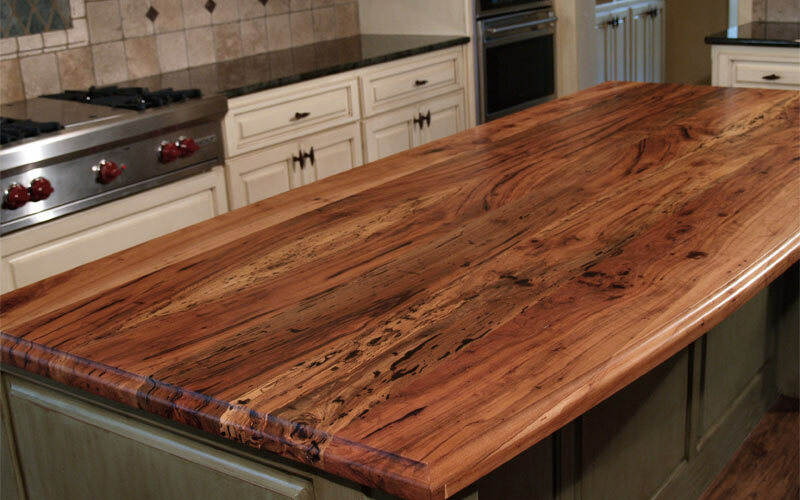 Manmade countertop materials tend to be more durable and heat, stain and bacteria-resistant but may not be considered as beautiful. Last, but not least, is budget. According to Improve Net, installing kitchen countertops can starts as low as $140 and go all the way up to $6,000. Most homeowners spend between two and three thousand dollars, averaging out at $2,705. However, if you love granite but don’t have the budget today, consider installing a more affordable option as a placeholder and upgrading at a later date when you have the funds. Don’t make your decision based on pictures alone. Find a store or showroom and check out all your options so you can experience the look and feel before making your final decision. Samples are often available so you can match your countertop to the cabinets, backsplash, flooring and wall paint. 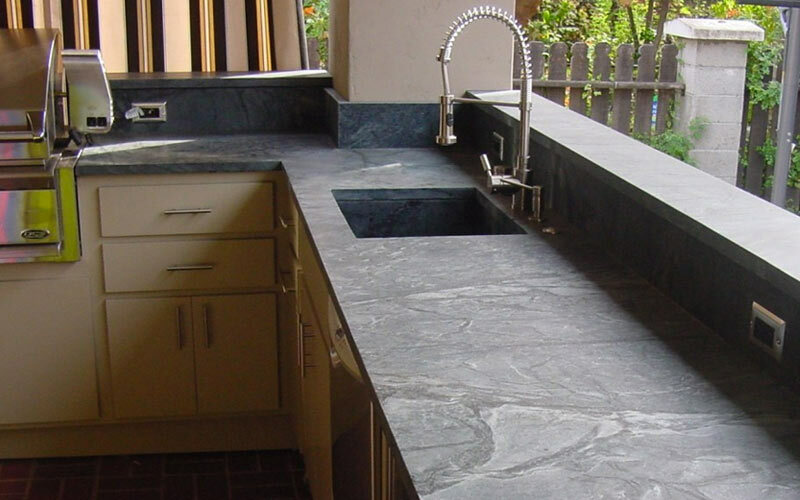 One of the most popular countertops, granite is also one of the most expensive. Pricing varies based on grade, pattern, color, and thickness. 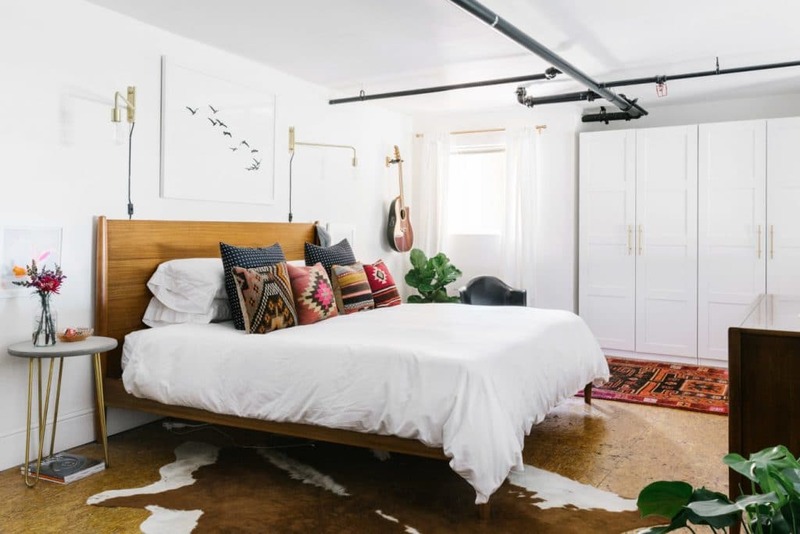 Get the high end look on a budget by choosing a thinner slab. 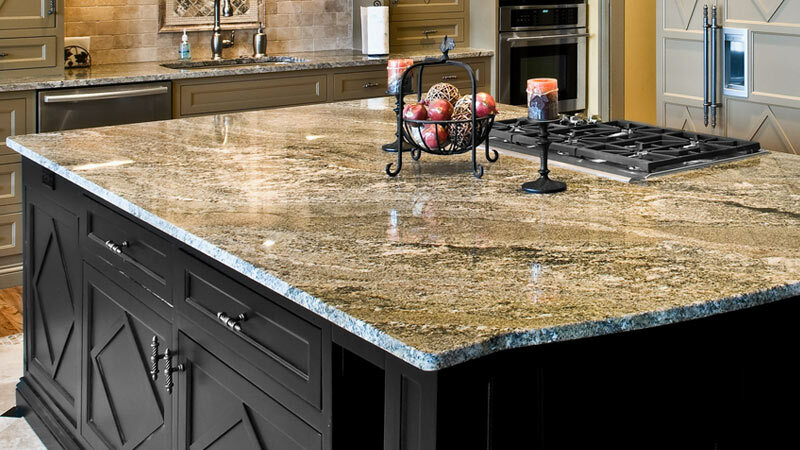 The stone is available in more than 20 shades of granite and polished or honed finishes. The durable surface requires some care. Annual sealing is necessary to prevent against oil and acid staining. While granite is scratch- and heat-resistant, high impact blows can chip the stone. 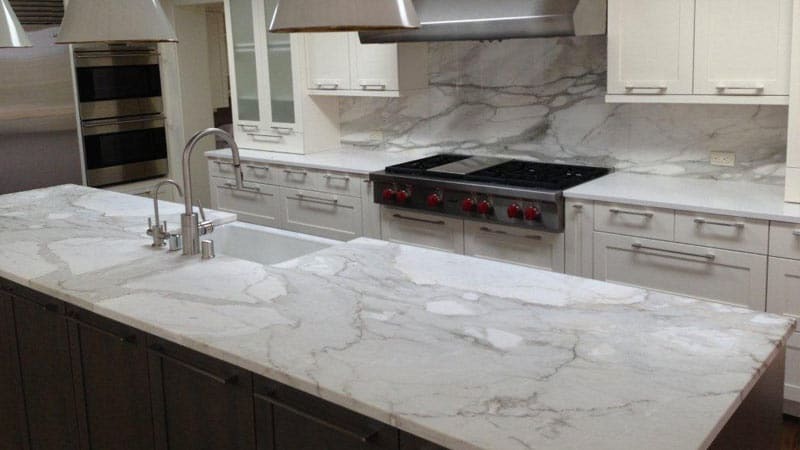 Timeless and currently trendy, grey-veined Carrara and Calacatta marble is a gorgeous choice for countertops. The cost is similar to granite although the porous stone is more susceptible to staining and may not be the best choice for avid cooks. Maintenance includes regular sealing and special care with anything acidic to prevent etching. With low abrasion resistance, marble scratches easily. Wipe any dark colored spills immediately to prevent staining, although wine stains are easily removed from marble. Like most natural surfaces, the appearance of marble will change over time. If that doesn’t appeal to you, choose a hardier alternative. For a stone as beautiful as marble or granite as a lower cost, there is travertine. A form of limestone formed under extreme heat and pressure, travertine comes in a range of hues ranging from ivory to cream, beige to gold and coral to walnut. In addition to countertops, travertine is also a popular choice for flooring. The durable stone is higher maintenance though. Highly reactive to acids, spills need to be wiped up immediately. The pitted surface can trap bacteria and needs to be disinfected regularly as well as sealed every 2-3 years. The soft stone also scratches easily and cannot be repaired. Available in a range of light to dark grays with light flecks and subtle veining, soapstone is the ultimate low maintenance natural stone. The smooth matte surface is stain, heat and bacteria-resistant and does not require any sealing. Architectural sandstone can also be fabricated into other forms like a matching apron skin or drainboard. Soapstone is susceptible to nicks and scratches, they add to the character of the stone and can be removed with sandpaper. Regular applications of mineral oil enhance sheen, minimize scratches and create a deep charcoal color. Also referred to as quartz, this man-made material is a blend of polymer resins with 90-95% ground quartz. Engineered quartz is the best of both worlds, with the durability of stone and consistency of a manufactured product. Made on one of the hardest materials available, quartz countertops don’t stain, scratch, burn, crack, or need to be sealed. 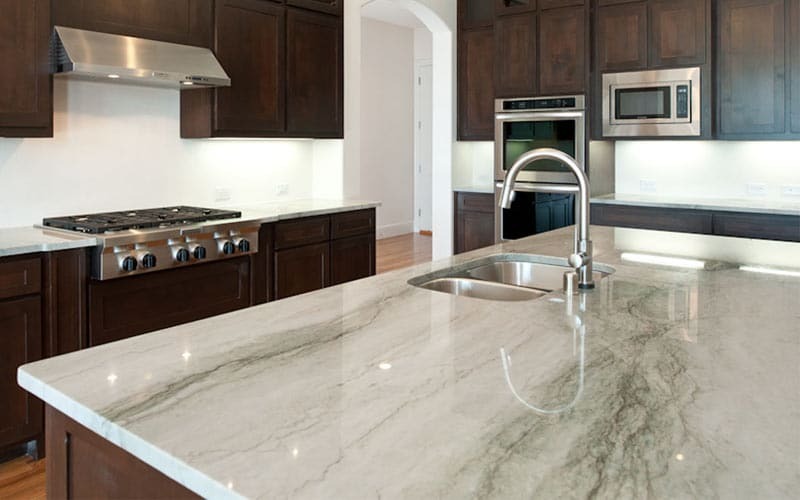 Available in a wider range of colors than natural stone, quartz is almost as popular as granite countertops. Commonly known by the brand name Formica, this retro countertop is also one of the most environmentally friendly. Composed of layers, laminates are 70% paper with a melamine resin base layer. 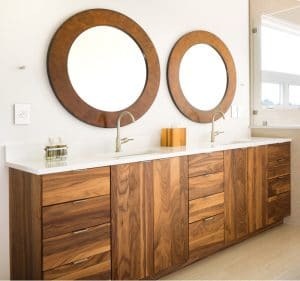 In addition to being the most budget-friendly countertop option, laminates are making a come back thanks to realistic stone and wood patterns and the saturated colors for mid-century styles. 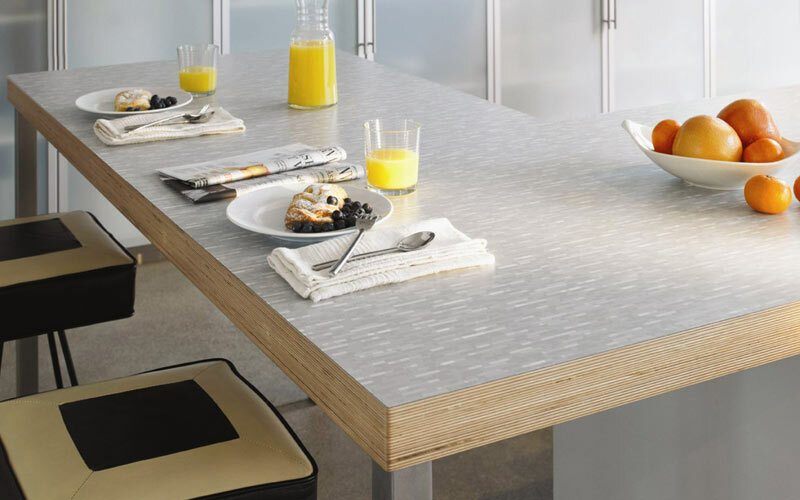 Formica alone has 123 color and pattern options, including a Jonathan Adler collection. Solid surface countertops, also known by the brand name Corian, are made of durable, man-made acrylic or polyester resins. 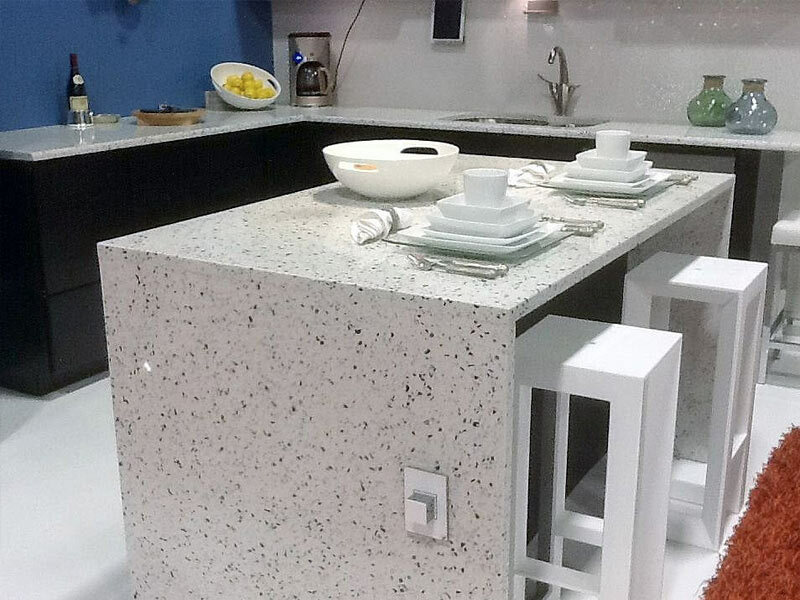 The non-porous countertops can be formed into any size and shape. When installed correctly, they appear seamless for a continuous look and easy cleaning. Although durable and heat- and moisture-resistant, solid surfaces can be damaged. Burns and scratches can be sanded out. 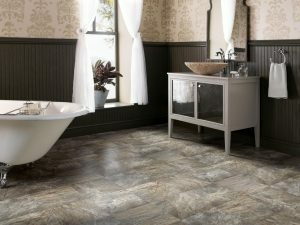 Available in a wide range of colors and textures, this is one way to get a stone look at a lower price. Not just for floors, tile can also be a countertop. 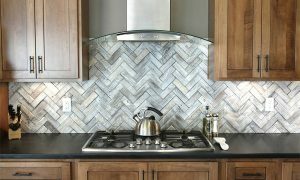 Available in an endless variety of colors and textures, tile can recover an existing surface for an easy DIY kitchen reno. A budget friendly option, tiles do crack but can be replaced. The biggest con to tiles is the grout, which is difficult to clean, collects food particles and is prone to staining. A dark grout will conceal the inevitable discoloration. Concrete countertops can be customized with any stain color and texture or mixed with other materials like glass, pebbles or seashells. 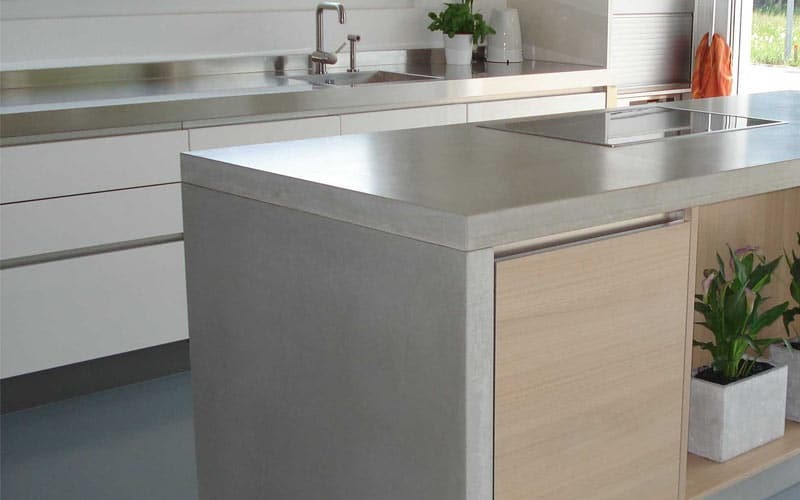 Concrete counters are very heavy but can be cast in the kitchen as well as made off-site and installed. Sometimes concrete can develop hairline cracks but they tend to be non-structural. 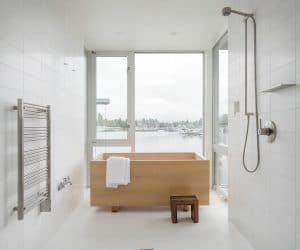 The very durable material is scratch and heat resistant but can be damaged by acidic liquids and must be sealed and maintained to resist stains. One thing that sets concrete apart from other countertop materials is energy efficiency. Concrete captures heat and releases it when the temperature cools down. 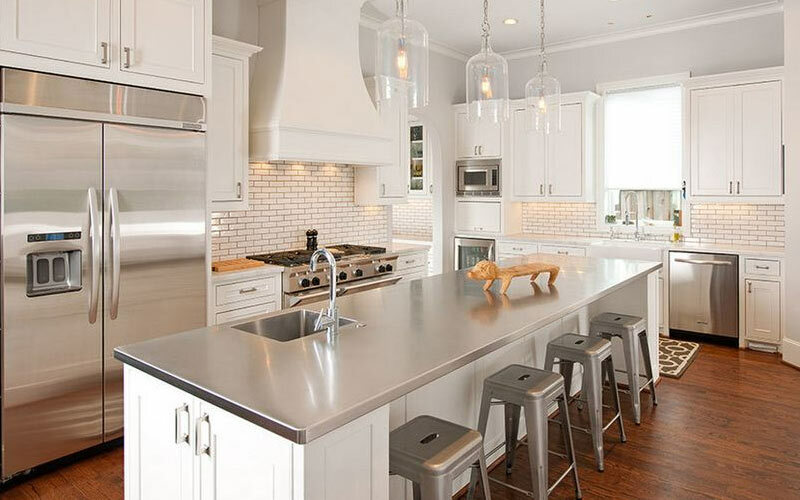 Nothing creates a more industrial look than stainless steel counters. The hardy metal is the countertop of choice for restaurants because it is easy to clean, stain-resistant, heat-resistant and anti-bacterial. However, stainless steel does scratch and dent, so no cutting on this surface. It is also one of the more expensive options. 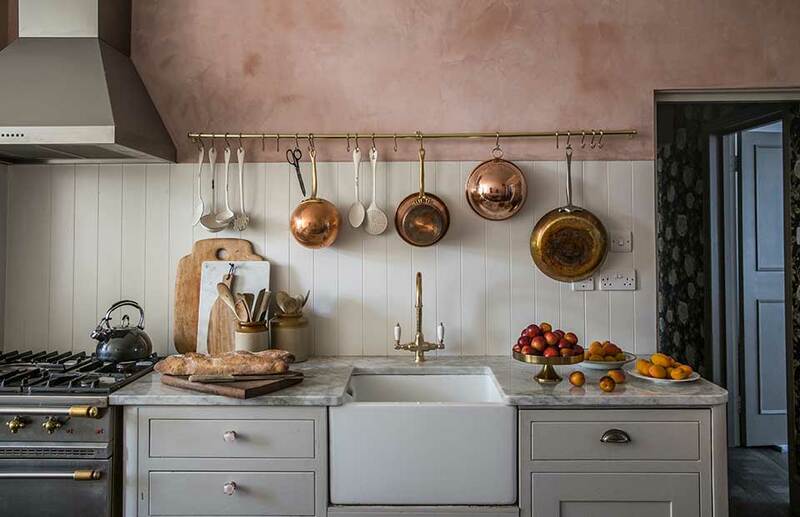 If you love the look of metal, other countertop materials include copper, pewter and zinc. Wood is durable, stylish, and the ideal surface for cooking. When properly sealed, wood countertops are sanitary enough to be used for chopping meat and heat-resistant enough resting hot pots and pans. 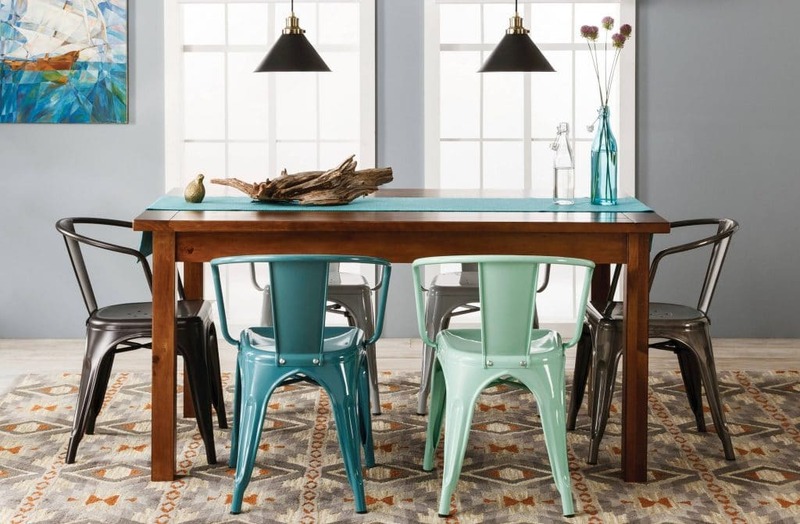 Wear adds an attractive patina to wood but oil the surface periodically to prevent drying. A popular choice is to mix wood countertops with other surfaces for a variety of prep surfaces. 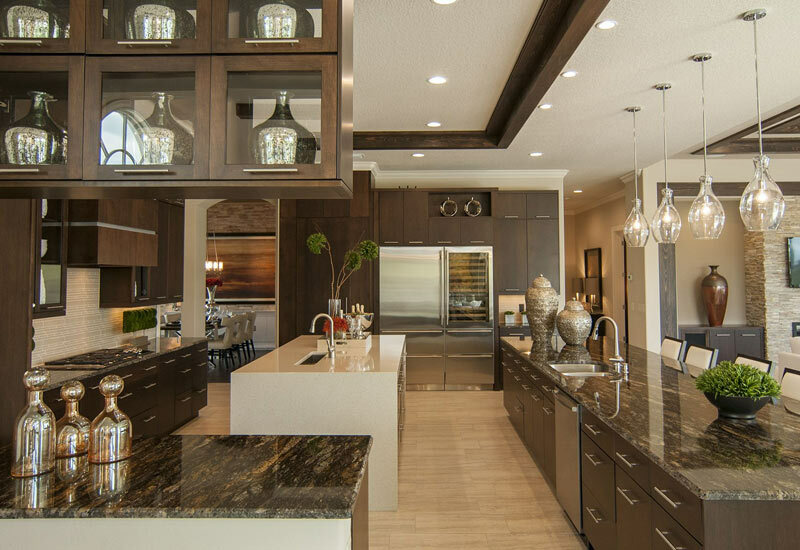 For example, combine a wood-topped island with contrasting perimeter. While butcher block is the most common wood countertop, slabs can be crafted from a variety of species and finishes as well as reclaimed. This glass won’t break. Between 0.75” and 1.5” thick, the non-porous surface is durable, easy to clean, heat-resistant, stain-resistant and hygienic. The translucent material is available in wide range of colors with the possibility of embedding textures for a unique look. Recycled glass is also an option for a sustainable choice. 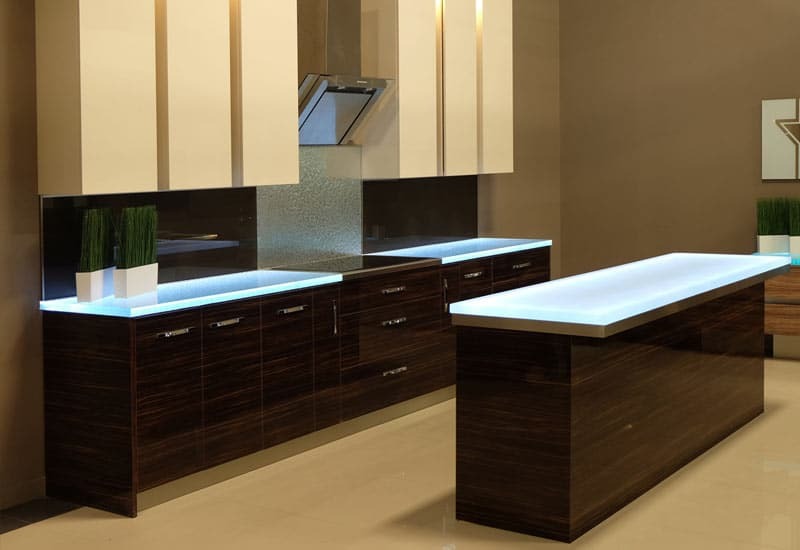 For a bold statement, glass countertops can have LED lights installed for a glowing effect. 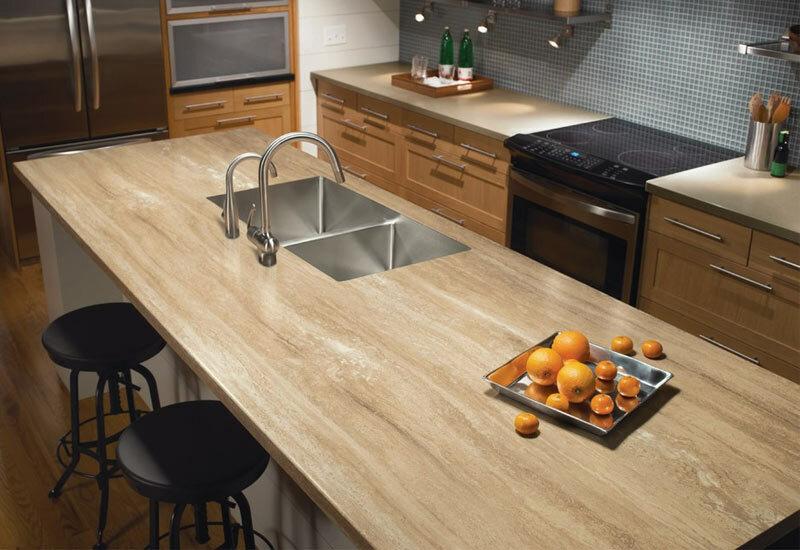 For the eco-conscious, recycled countertops are available in variety of sustainable materials, including concrete, glass, paper, composite and plastic. 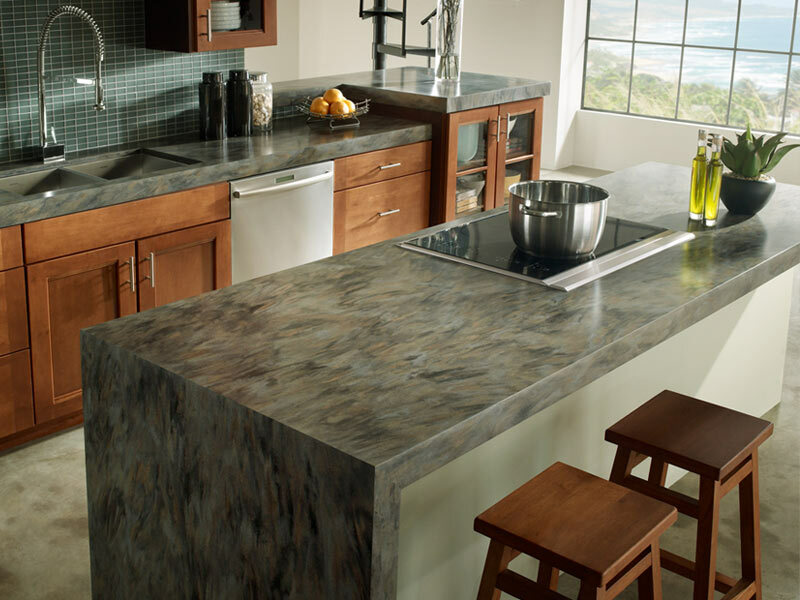 Usually a mix of pre- and post-consumer products, recycled countertops come in in a wide range of colors and textures.